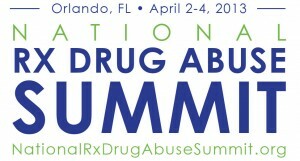 More than 120 presenters are set to lead a national discussion about ways to “Make An Impact” on the prescription drug abuse epidemic when the 2013 National Rx Drug Abuse Summit convenes in Florida April 2-4. I am thrilled at the exceptional caliber of presenters assembled for this conference by the Summit’s National Advisory Board. The quality of their presentations is reflected in our ability to offer multiple continuing education credits for medical professionals (physicians, nurses and pharmacists), social workers, attorneys, addiction and prevention specialists, human resources, criminal justice and insurance professionals. There is still time for you to add your voice to the more than 800 conference attendees from across the United States who will collaborate on impactful solutions at local, state and national levels through timely and data-driven data about the prescription drug abuse crisis. 30 breakout sessions grouped into educational tracks (law enforcement, education/advocacy, clinical, treatment, pharmacy and third-party payer). These sessions will be led by professionals from many disciplines on the frontline of efforts to prevent, mitigate and respond to prescription drug abuse issues. Nine workshops on three important focus areas: U.S. military, prescription drug monitoring programs and successful strategies for community change. Eight vision sessions offering in-depth examination of innovative programs and strategies from organizations and businesses deeply involved in the fight against Rx abuse and diversion. Four idea exchange sessions providing an interactive discussion on issues pertaining to the Appalachian region, neonatal abstinence syndrome and addiction among teens. A panel discussion featuring five members of the bi-partisan Congressional Caucus on Prescription Drug Abuse. Learn what actions are currently being taken in Congress. For information about the Summit visit www.NationalRxDrugAbuseSummit.org, or follow news about the event at Twitter.com/RxSummit, Facebook.com/RxSummit, or LinkedIn.com/RxSummit. Questions may be directed to Eric Rice at 606-657-3218 or erice@centertech.com.